The Norwood High School Mustang Marching Band and Color Guard is a competitive extra-curricular activity open to all interested students in grade 8 through 12. Students will have the opportunity to experience and perform music and drill designed specifically for the NHS Marching Band. 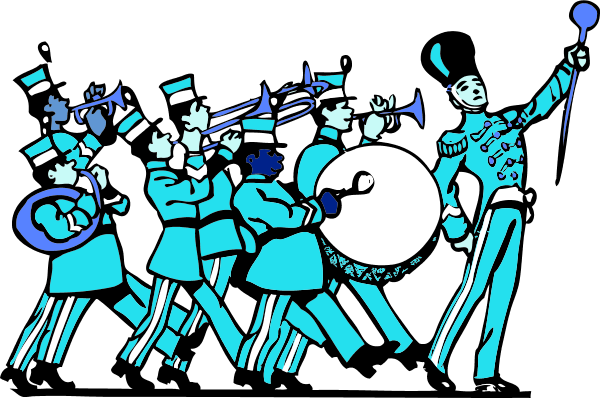 Participation in the Marching Band & Color Guard is determined by recommendation of the Norwood High School Band Director. Students enrolled in this ensemble will be required to attend a week of marching band camp, and all out-of-school rehearsals and performances. In addition, a student’s attitude and behavior must meet the standards set by the Band Director and Director of Fine Arts. Performances include MICCA & NESBA competitions, select NHS football games and community parades. We are so excited as we finalize preparations for Music camp. We are leaving in 9 days! Attached you will find a Music camp Bulletin that gives you information about what your student should bring with her or him. Hydration is important, as well as proper foot wear. All students should have the music they will need at camp. There are no photocopiers available, nor printers. This is a camp in a beautiful woodland setting. Should you have any questions, please contact Cathy Moen at cmoen@norwood.k12.ma.us or me at lisasilletti@gmail.com. At this point, if you need to provide a photograph, medical cards, or other documentation, you are responsible for bringing with you on the morning of departure. Please do not email it to me, I will not have access to a printer prior to departure. Reminder to Senior parents – please let me know if you intend to come to Senior Night at camp or not. Thank you. Camp is three weeks away! If you have not received an email that your student’s Music camp Registration is complete, and you included photo, medical insurance cards, and all required paperwork, and completed the payment ($400.00), please contact me. We meet at Norwood High School on Sunday, August 13th at 7:45 AM in the morning in the Auditorium to prepare for our departure for Camp Tapawingo. Leave all bags on the sidewalk along the student drop-off area in the rear of Norwood High School and enter through door 14. Parents are asked to come into the auditorium to meet with the camp medical staff and hear the camp guidelines. Also, help will be needed to load the truck with equipment. Please help, if you are able. Medicine UPDATE:Should you need to add travel medications to your student’s Activities and Medical Authorization form prior to departure for camp, you will need to have your child’s medical provider sign the form. PS Senior students – last call for Tshirt sizes! Above are the forms you will need to fill out and return to the Fine Arts Department office at the High School. Camp happens in August with students in the Marching Band grades 8-12, NHS Madrigal choir, String Orchestra, Chamber Choir & drama programs. The students attend a week long music camp at Camp Tapawingo in Sweden, Maine. The purpose of this camp is to provide an uninterrupted atmosphere in which students in these groups can prepare for their upcoming competitive and performance seasons. For many years our Music Camp ventures have been a tremendous success, both musically and socially. The daily schedule includes 7-1/2 hours of daily rehearsals and classes, supplemented by a variety of recreational activities, which are an integral part of our program, such as swimming, softball, football and basketball.